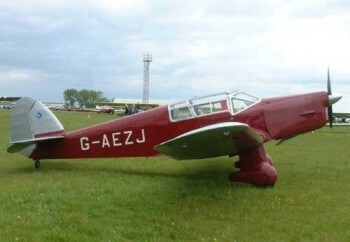 The Percival Vega Gull was a pre-war civilian version of the Percival Proctor, which was also a development of the pre-war Gull. The prototype D.1 Gull (G-ABUR), a three seat tourer first appeared in 1932. This was followed by the D.2 which was more commonly known as the Gull IV. In 1934 Percival introduced the D.3 Gull Six which featured the DH Gipsy Six engine, improved undercarriage and cabin arrangements, but retained the Gull IV folding wing. It was in a Gull, G-ADPR that New Zealand Aviatrix Jean Batten set many of her records. type: Four seat communications aircraft. Height: 7 ft 4 in / 2.23 m.
Service ceiling: 18,000 ft / 5,486 m.
Range: 539 n.mls / 998 km.